I regret to say that I have to spend my holidays writing three lectures … a job which I loathe as waste of time … all the more unpalatable, as I am anxious to get at a little three-act opera ‘The Cricket on the Hearth’ which is much more to my taste and in my line. Though full of bonhomie and with as happy an ending as could be wished for, the story is motivated by the insidious and dark passion of sexual jealousy. It is the cricket on the hearth as a symbol of domestic content that effects the magical cure. Its cheerful, insistent chirping reminds the elderly carrier, John, of his love for his much younger wife and leads him to forgive her supposed infidelity before the truth of her innocence is known to him. Mackenzie’s operetta was written ‘con e per l’amore’. The vocal score was published in Leipzig in 1901 and the overture was premiered in London in 1902, but the simultaneous appearance of a setting by Goldmark postponed Mackenzie’s chance of a production, the first being at the Royal Academy of Music in 1914. Goldmark’s setting was described tersely by the impresario Augustus Harris, who protested, ‘There isn’t any cricket, and the hearth is a German stove!’. 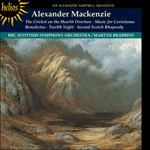 Mackenzie makes good these deficiencies with an overture as bright as it is warm, and calling for a ‘cricket instrument’, kindly adding ‘ad lib’ to a request not easily fulfilled but duly honoured on this recording. John the Carrier’s whip also features, and the overture starts with a marvellous evocation of a kettle coming to the boil, the first line of the story being, ‘The kettle began it!’. At a party to celebrate the production, Mackenzie’s students presented him with a silver kettle pouring forth steam in the form of liquid oxygen. Following the kettle’s introductory bubbling cross-rhythms, colourfully orchestrated in a bright G major, comes an ‘Andante espressivo’ in the warmer key of E flat, suggestive of human rather than inanimate domestic warmth. An ‘Allegro energico’ follows the carrier’s cart with rumbustious good humour and the occasional crack of the whip, but on arrival home it yields its place to a tranquil, warm-hearted tune, beautifully shaped and harmonized. A lively dotted rhythm appears, featuring splendid piccolo writing, and is brilliantly combined with its predecessors; after the return of the ‘Tranquillo’ it leads to a final celebratory ‘Maestoso’ as joyous and full-blooded as the best of Dickensian endings. Je regrette de dire que j’ai passé mes vacances à rédiger trois conférences … une tâche que je déteste et que je considère comme une perte de temps … ce travail fut rendu encore plus désagréable du fait de mon impatience à me plonger dans la composition d’un opéra à trois actes, «The Cricket on the Hearth», qui est beaucoup plus de mon goût et de mon genre. Même si l’histoire semble à première vue remplie de bonhomie et possède une fin aussi heureuse que l’on puisse se l’imaginer, elle est en fait motivée par la passion insidieuse de la jalousie sexuelle. Le chant enjoué et insistent du grillon rappelle l’amour de John, le transporteur âgé, pour sa femme beaucoup plus jeune que lui, et l’amène à lui pardonner son infidélité supposée, avant que la vérité sur son innocence ne lui soit divulguée. L’ouverture débute par l’évocation merveilleuse d’une bouilloire qui arrive à ébullition, la première phrase de l’histoire étant «C’est la bouilloire qui a commencé!». Lors d’une fête pour célébrer la production, les élèves de Mackenzie lui offrirent une bouilloire en argent qui laissait échapper de la vapeur sous forme d’oxygène liquide. Ich bedaure, sagen zu müssen, daß ich während meiner Ferien drei Vorlesungen verfaßt habe … eine Tätigkeit, die ich als Zeitverschwendung verabscheue … und dies ist um so unerträglicher, da mir sehr viel daran liegt, eine kleine dreiaktige Oper mit dem Titel „Die Grille auf dem Herd“ fertigzustellen, die meinem Geschmack und meinen Fähigkeiten weitaus besser entspricht.